Download this handy guide to help you plan your ultimate gameroom! 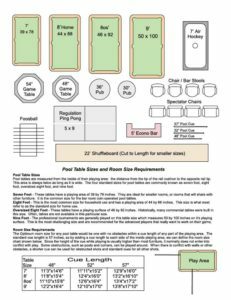 All of the sizing information on pool tables, shuffleboards, game tables, pub tables and other gameroom furniture are to scale. Find out beforehand if you have space for a regulation size pool table and a Foosball, or if a 7′ billiard table with a pub table and two bar stools is what your space will allow. Click on the picture to download. It is important to know the “real” size of an existing pool table. Make sure to check out our How to Measure Your Pool Table page to get this very important number. Hello I have a 11 x 15 space. Will a 7ft table work? And what size cue? 52″ cue unless the room opens to another space. 11×15 is a bit tight and you should really consider a larger space. My room is 17’,x 11’ was hoping to fit a 8ft with short cues do you think a 7 1/2 ft would work ? Hi there, I have an Indoor Pool Table that I will be placing outdoors. I will be putting it under a patio cover, along with an additional cover for the table. Do you suggest putting the actual table on something to protect the legs from any water exposure? Depends on the style of leg. A rubber shim might help prevent water seepage. I have a 6 foot table, now length of the room is not an issue. The width I have a question about. The room is just under 9 and a half feet. How acquired will that be to truly play. Not exactly sure what your question is, but a room that is 9.5 feet is too small for a pool table. Hello, I have a room that’s 13’ by 14’, but it’s open on one side of the 14’ dimension. I think a 6 foot table wood be best, but can’t seem to find one. Do you sell any 6’ pool tables or is there no such thing? Thank you. A seven-footer will fit just fine in your space nudged toward the opening. Six-footers are very uncommon, though they can be custom made. Honestly, your better going with a seven foot or not a pool table at all. You’d need a 48″ for the width for a cue ball resting on or near a cushion. You could stick with a full length for the majority of shots. Good Evening. We have a room (length 24′ width 11′). One side of the room has an 8 ft opening where the center of the table would be. I’m dying to try for a 9′ table but really could use some advice. Thank you. Hello Shawn, a nine foot pool table would be very tight in that space you’ve described. If you centered the table on the 8 foot opening you’d only leave yourself 36 inches of space between the side rails and wall. If i were you i’d consider putting a seven foot “bar size” pool table in this are. You could possibly squeeze an eight footer but even that may be too tight for some folks. Christy, I am not at my shop to measure the Peyton pool/dining table but if memory serves correctly the height with tops on is around 33 inches and the the measurement from floor to bottom of frame is about 26 inches. I have a pool table I brought from Baltimore when I transferred here. I have an outside enclosed outdoor area That where i was thinking about putting the table moved too. I’m not sure that with this heat that’s a good idea. What do you guys think? James, I,ve had many clients setup pool tables that were not true “outdoor” pool tables outside under a covered patio without any trouble. I’d order an outdoor cover to protect against dust from setting into the felt and to stop sunlight from damaging the playing surface and/or fading the finish. Best, David. Trying to make a formal dining into a game room – dimensions are 12’8×13’0 is this at all possible? Jennifer, no i would say the room is too square, too small on the length. Pool tables are rectangular and really work best in a room the same shape. Imagine if your pool table was 3 foot by 6 foot you’d want to allow about 42-58 inches of cuestick clearance on all four sides of the pool table for comfortable shooting room. Best, DK. Room is 14′ by 18′ but the long end of the table would need to fit in the 14′. One side of the 18′ is open. Deciding between 6′ and 7′ table – sounds like I may be OK with 7′? Hi Luc, you’re right a seven foot pool table would fit the best. You would still need to use a 48 inch cuestick for some shots but that’s only if you center the table end to end in the 14 foot section of the room. If you skewed the table more towards the opening along the 18 foot section of wall then you could probably use the table without the need for the shorter cue length I previously mentioned. Happy cueing, David. I have a room that is 13 ft 4 inches by 11feet 8 inches would it be enough room for a 7 foot or 6 foot pool table? Hello Karl, a 7 foot pool table would work although it might be a little tight but short cuesticks would solve the problem. I sell cues ranging in size from 36-52 inch. Thanks for reading my blog, David. Hello Angela, the outside dimensions of a pool table are different depending on which size you order. If we’re talking about an 8ft pool table then the outside dimensions are approximately 55 by 99 inches and the interior dimensions are 44 by 88 inches. Best regards, David.